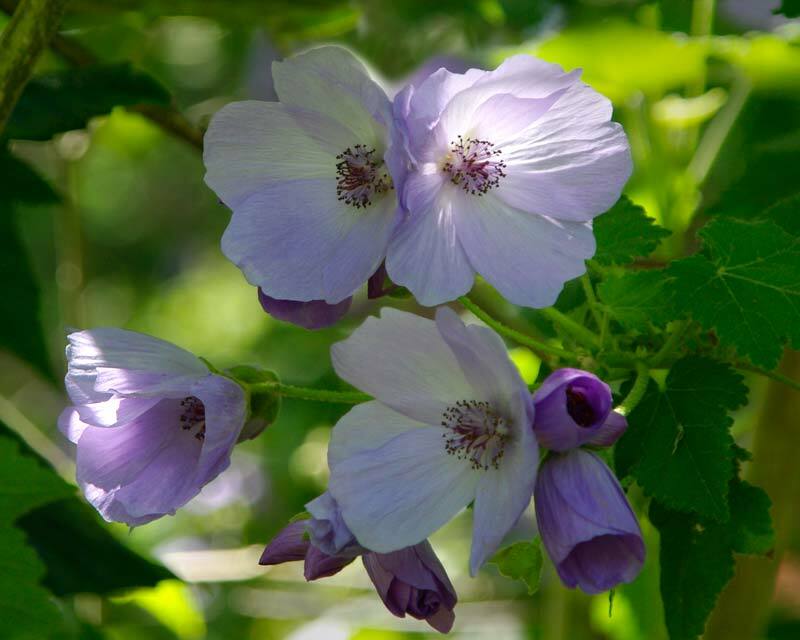 Abutilon vitifolium is a medium-sized, deciduous shrub, with mauve to purple to blue cup shaped flowers that are around 6cm across. 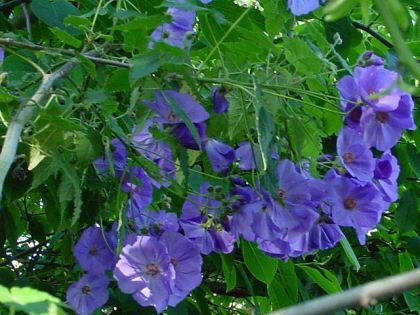 It flowers in mid to late Summer and grows well in direct sun but a little shade from the hottest afternoon sun will be preferred. The downy, deeply-cut leaves are grey-green, vine-shaped and are attractive in all seasons, but especially when backing the profusion of wide open flowers which make a great display. A sunny and sheltered spot free from winds is the best position for it, although it will make an excellent free-standing shrub in sheltered and warmer areas. Abutilon x Suntense is a cool climate hybrid that will tolerate moderate frosts. 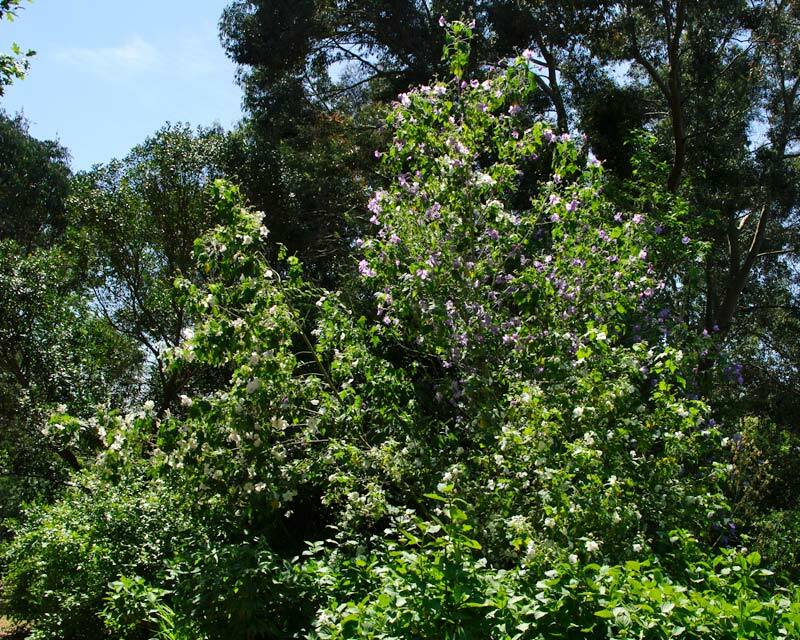 During spring and summer it is covered with mauve to purple flowers. Soil: It should be planted in well drained and fertile soils of most types (but prefers lighter soils) in early to late spring to give it time to get established before winter. Mulch in winter to keep roots warm and retain moisture in summer. 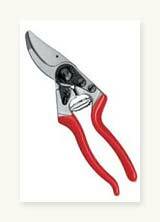 Maintenance: Tip prune to promote a bushy habit, older plants can be pruned back hard in spring. Propagate by softwood cuttings in spring. Keep watered in summer and apply a liquid fertiliser every couple of months in the growing seasons. Other Species: Abutilon is a large genus of around 150 species of evergreens. Comments: Flowers can be eaten as part of a salad. 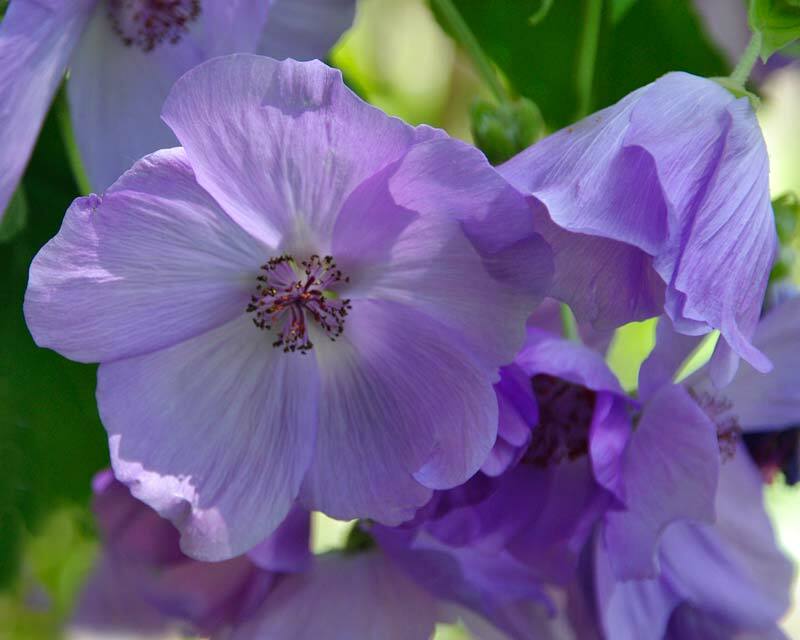 This is a popular garden plant and has earned the RHS Award of Garden Merit. Silvia - Milan- Italy. : Thank you very much for this article Bob. Very useful to me. I´ve learnt some things I didn´t know!. Carole Brooks - Encounter Bay, South Australia: Always thought this was a form of native hibiscus or Chinese lantern (abutilon vitifolum) upright form of flower. Good information. Thanks..